A while back I asked if some of you would share a story of one of your Significant Encounters. The following is the story of a Significant Encounter written by dear my dear friend Joy. I’ve known Joy a long time. I’ve seen her at her best and I’ve seen her at her worst. Here is one account where she met God, and that Significant Encounter, changed everything. “You is kind. 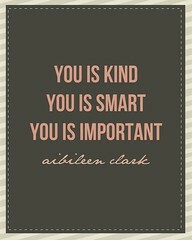 You is smart. You is important”—these words crashing through my mind on the way to church on a Sunday morning. Anyone who has seen the movie The Help recognizes them. They were spoken by a woman whose faith was strong and believed in the power of building up the soul of a little one taken for granted by her mom. Then my loving father brought to mind my favorite book written by Karen Kingsbury. It is a modern day version of the life of Mary Magdalene. I was thinking about the fictional Mary Madison who is given a precious gift from her grandma, the one person in her life who truly loved her. Before her life falls into turmoil and horror, her grandma gives her a little beaded purse with a card containing the words of Jeremiah 29:11. A verse filled with hope and promise. Maybe you can’t hear his voice yet but the good news is that no one has to stay in lies and captivity. There is one who wants to set us free. He is always listening, always caring, always wanting to release the chains and set us on the path of life. I was one who struggled with shame, regret, and deep debilitating depression for a time in my life. Today I am free from those chains and I know in my heart that his love can set you free. He is the one who continues to be my refuge and whose everlasting arms are underneath me embracing and supporting me every day.